This annual meeting was an opportunity for Division of Maternal and Child Health Workforce Development (DMCHWD) grantees to convene and network around a cross-cutting topic of interest. The meeting was hosted by AUCD's Interdisciplinary Technical Assistance Center on Autism and Developmental Disabilities (ITAC). The meeting addressed how to compose and share your program’s story from a high-level perspective, emphasizing effectiveness, impact, and interaction with key audiences. It also underscored the value of building and establishing relationships with decision-makers, state agencies, community organizations, and more. This webinar will include a highlight of new data, as well as strategies, resources, and state efforts to improve and promote developmental screening through Title V program activities. Information from the recently published article on Prevalence and Variation of Developmental Screening and Surveillance in Early Childhood will also be shared. Boston University School of Public Health. The demographics of students entering into master of public health programs has shifted over the years yielding classrooms full of eager students with little professional workplace experience. Hiring managers and supervisors in the field have increasingly wanted graduates to be more prepared to work effectively in teams, apply critical thinking and problem solving skills, and demonstrate basic managerial functions like work-planning and agenda setting. Many methods can be deployed to engage students in a manner that prepares them not only with the content and technical skills needed to thrive in the public health workforce, but with the essential professional skills, as well. Join Trish Elliott for a conversation about how to transform a traditional graduate classroom environment into a space where professional skills can be developed, practiced, and assessed. We’ll have a 20-minute presentation followed by 20 minutes of discussion and collective problem solving among our community of both academics and employers. Registration is limited to 125 participants, so please register early. ATMCH has secured 1.0 CPH credit for participating in either the webinar or webinar archive. If you missed the live webcast, you can now view the NO COST archived webcast for the Spring 2018 PHW 2. Please complete the evaluation for this archived webcast colloquium. This archived webcast has been approved for continuing education credits for Registered Dietitians, Certified Health Education Specialists, and Registered Nurses. Please note, this archived webcast includes a re-recording of the first presentation by Sheryl Ely due to technical difficulties during the live webcast. If you would like any additional information, please contact us by email. Home visiting programs have consistently shown positive effects, yet little is known about differential effects for subpopulations or how best to personalize services. The HRSA-MCHB Home Visiting Applied Research Collaborative (HARC) will develop methods for precision home visiting to promote innovative research. This webinar will feature presenters from the HRSA-MCHB funded Home Visiting Research and Development (HV R&D) Platform. This platform is a transdisciplinary network for scientific collaboration and infrastructure building for innovative home visiting research. HV R&D plans, develops, and sustains a R&D network of early childhood researchers and practitioners to frame, implement, and report on innovative, transdisciplinary research related to precision interventions to improve meaningful outcomes for at-risk families and communities. Lauren H. Supplee, Ph.D., is the deputy chief operating officer for Child Trends and senior program area director for early childhood research. She has devoted her professional career to research and evaluation with the goal of applying this to policy and practice. She is committed to conducting research and evaluation that can contribute to program improvement and improved outcomes for children and families. Her research has focused on evidence-based policy, social-emotional development in early childhood, parenting, prevention and intervention programs for children at-risk, and implementation research. Prior to joining Child Trends, Lauren worked for the federal Administration for Children and Families in the Office of Planning, Research, and Evaluation for ten years, with the last four of those as the director of the Division of Family Strengthening. Sarah Crowne, Ph.D., is an Assistant Scientist in the Department of Population, Family and Reproductive Health at the Johns Hopkins Bloomberg School of Public Health and a HARC Leadership Team member with more than 15 years of experience in this area. She is also a HARC study team member, report author for the Mother and Infant Home Visiting Program Evaluation (MIHOPE) and MIHOPE-Strong Start studies, and Co-Investigator for New Jersey’s statewide home visiting evaluation. If you work with or plan programs for women of reproductive age and their families, you will not want to miss this webinar! present facts about the virus, its epidemiology and what we know about modes of transmission and clinical manifestations including the congenital Zika syndrome; · summarize best practices for public health professionals, including in the areas surveillance and family planning; · summarize best practices for clinicians, including screening, counseling, and care of pregnant women and parents of Zika-affected newborns. Dr. Brown, the Deputy State Epidemiologist for the State of Massachusetts Department of Public Health, will serve as discussant and conclude the webinar by describing how collaborations between local and state health departments and MCH organizations can vastly extend the reach and effectiveness of public education about Zika, prevention and preparedness. The final 10 minutes will be open for audience questions and comments. In October 2015, the American Academy of Pediatrics (AAP) engaged Altarum Institute to provide Technical Assistance (TA) to the Healthy Tomorrows Partnership for Children Program (HTPCP) grantees on conducting an economic analysis of their projects. Economic analysis aids grantees in demonstrating the value of their Healthy Tomorrows interventions to key partners, thus supporting the need for sustained funding to produce positive health outcomes. Altarum provided TA to eight HTPCP grantees, during a 9-month pilot period, on how to use their evaluation data to conduct an economic analysis that would be appropriate for their projects, including a Return on Investment (ROI) analysis, a Cost Effectiveness Analysis (CEA), or a Cost Benefit Analysis (CBA). The projects involved in the pilot used a range of interventions to address a wide variety of health issues, and had different data sets, funding histories, and evaluation capacities. Altarum provided TA to grantees, tailored by program type and capacity level, to prepare them for the ROI process. With higher capacity grantees, Altarum followed-up on the identification of measurable outcomes, the availability of data on identified outcomes, and the entry of data into a cost template to calculate ROI based on the value/impact of these outcomes. Through the project, Altarum has developed a webinar of the ROI process tailored for HTPCP grantees, based on the lessons learned through the TA activities. In the webinar, viewers will learn first-hand from two HTPCP grantees about their experiences participating in the project and their tips on what projects should do to prepare themselves for an economic analysis. Is the money spent on a project justified by the benefits that result from the project? Does one option provide better value than another option? Where can money be placed for the best effect? Does the project save money? On December 15, 2016 the Division of MCH Workforce Development held a Funding Opportunity Technical Assistance Webinar for the Autism CARES Act National Interdisciplinary Training Resource Center (HRSA-17-010). On August 3, 2016 the Division of MCH Workforce Development held a Grantee Orientation Webinar. An opportunity for targeted Q&A with DMCHWD staff . The Division of MCH Workforce Development is pleased to present a new MCH Training Diversity Resource designed to share strategies and resources intended to support MCH Training Programs in their diversity efforts. The Resource is available on the Division’s web site here. On June 22, 2016 we held a web meeting to share information on the intent of the Resource, suggestions on how to use it, and upcoming virtual technical assistance office hours for grantees who have a special interest in sharing strategies they are implementing or discussing how to overcome barriers to implementation of diversity and health equity related strategies. Robert W. Grundmeier, MD (Bob) is a practicing Primary Care Pediatrician at The Children's Hospital of Philadelphia (CHOP) and an Assistant Professor of Pediatrics at the University of Pennsylvania School of Medicine. He currently serves as the Section Chief of Informatics in the Division of General Pediatrics, and is the Director of the Clinical Reporting Unit in CHOP’s Department of Biomedical and Health Informatics (DBHI). Bob is a founding member of the Pediatric Research Consortium (PeRC), which facilitates EHR-mediated research within CHOP's dozens of primary care practices across the region. Prior to the webinar, we encourage you to test your connection to ensure proper functionality and get a quick overview of Adobe Connect. WEBINAR: Who's Leading the Leading Health Indicators? Despite major advances in medical care, challenges in maternal, infant, and child health still exist in the United States. However, by putting evidence-based practices and processes into action, pregnancy outcomes and maternal, infant, and child health can be improved. Join us on Thursday, September 17 to learn more about evidence-based maternal, infant, and early childhood home visiting and how this can improve birth outcomes and impact infant mortality. The Health Resources and Services Administration’s Maternal and Child Health Bureau (MCHB) is pleased to announce an upcoming DataSpeak program titled Vitally Important: Improving the Timeliness of Vital Statistics to Advance MCH. Vital statistics—the data and health indicators collected from vital records on births and deaths—are an important source of data for answering national and state health questions. Birth and death records allow states to track maternal, fetal, and infant mortality, adverse birth outcomes, delivery characteristics, and maternal risk factors, among other statistics. Improving the timeliness of these records is essential to making sure they are most useful for monitoring and advancing public health efforts in real time. This presentation will focus on how states are working to improve vital statistics timeliness and data sharing, and how this is helping to inform and improve programs and health outcomes for women and infants. Patricia W. Potrzebowski, PhD, Executive Director of the National Association for Public Health Statistics and Information Systems, will present on the importance and need for improving timeliness of vital records data. Dr. Potrzebowski will review a number of efforts underway to make vital statistics more current and thus more useful for public health program purposes. Glenn Copeland, MBA, State Registrar for the Michigan Department of Community Health, will present a summary of the work being done to provide more timely data on infant mortality in Michigan in order to better inform programs working to improve outcomes, with a focus on the Collaborative Improvement & Innovation Network (COIIN) to Reduce Infant Mortality. John Paulson, Data Center Supervisor at the Bureau of Vital Statistics, Ohio Department of Health, will discuss how Ohio compiles, augments, and uses the data in its public health data warehouse with a focus on using the State and Territorial Exchange of Vital Events (STEVE) System. DataSpeak is a series of online conferences that feature special topics related to MCH data. Each event features one or more speakers who are considered experts in their field. The MCH Epidemiology and Statistics Program, who coordinates these DataSpeak conferences, is dedicated to the goal of helping MCH practitioners on the Federal, State, and local levels to improve their capacity to gather, analyze, and use data for planning and policymaking. As part of its Autism Awareness Month activities, the State Public Health Autism Resource Center (SPHARC) will host a webinar that highlights programs to improve ASD/DD screening, early identification and evaluation services. Presentations will include lessons learned from the Assuring Better Child Health and Development (ABCD) Initiative and Oregon's state implementation grant project - ACCESS: Assuring Comprehensive Care through Enhanced Service Systems for Children with Autism Spectrum Disorders and other Developmental Disabilities. The Autism SIG will host a webinar which focuses on autism and co-morbid mental health conditions in children. We will focus on the challenges families face in accessing comprehensive services, as well as community and school based interventions. Dr. Cathy Pratt BCBA-D is the Director of the Indiana Resource Center for Autism. IRCA is a statewide program that works to build local capacity for families and professionals to address the needs of individuals on the autism spectrum across the lifespan. Dr. Pratt coordinates the Autism Special Interest Group (SIG) through the Association of University Centers on Disability (AUCD. Dr. Pratt serves on numerous Advisory Boards, including the Advisory Boards of Maap Services, Inc., the Temple Grandin/Eustacia Cutler Autism Fund and the College Internship Program. Dr. Pratt also serves on the Panel of Professional Advisors for the Autism Society and is currently involved in their strategic planning. Dr. Pratt is co-chair of NATTAP (Network of Autism Training and Technical Assistance Programs). In addition, she is a member of the National Autism Leadership Collaboration. She writes and presents internationally on the following topics: autism spectrum disorders, functional behavior assessment/positive behavior supports, applied behavior analysis, instructional approaches, evidence-based practices, systems change, and policy. Prior to pursuing her doctorate at Indiana University, Dr. Pratt worked as a classroom teacher for students across the autism spectrum and with other disabilities. Heidi Cloutier started her career in Community Mental Health as a vocational counselor and case manager for individuals with chronic and severe mental illness and drug and alcohol addiction. In 1999 she began working at the University of New Hampshire Institute on Disability where she has worked on various research projects. Heidi presents nationally on topics of transition, creating individualized budgets and person centered planning. She currently facilitates planning for youth with autism spectrum disorders, trains new Person Centered Planning Facilitators, and provides mentoring and technical assistance for mental health counselors and other transition planners. Heidi is currently a RENEW Trainer, and one of the Co-creators of a new evidence based treatment for youth with Autism Spectrum Disorders called Family Centered Transition Planning. Heidi Cloutier started her career in Community Mental Health as a vocational counselor and case manager for individuals with chronic and severe mental illness and drug and alcohol addiction. In 1999 she began working at the University of New Hampshire Institute on Disability where she has worked on various research projects. Heidi presents nationally on topics of transition, creating individualized budgets and person centered planning. She currently facilitates planning for youth with autism spectrum disorders, trains new Person Centered Planning Facilitators, and provides mentoring and technical assistance for mental health counselors and other transition planners. Heidi is currently a RENEW Trainer, and one of the Co-creators of a new evidence based treatment for youth with Autism Spectrum Disorders called Family Centered Transition Planning. Shannon Haworth is a Senior Program Specialist, on the MCH Technical Assistance team at AUCD. She is the parent of a child with autism and co-morbid mental health issues. She most recently worked for the Partnership for People with Disabilities as the Project Manager for the Virginia state autism implementation grant. She is a former Virginia LEND (Leadership Education in Neurodevelopmental Disabilities) trainee. Shannon has a Masters degree in Applied Behavior Analysis, and a graduate certificate in Autism from Ball State University. She has also earned a Post Baccalaureate Graduate Certificate in Disability Leadership from Virginia Commonwealth University. She is a published author on autism, minority children, and children's mental health, as well as parents experiences receiving an autism diagnosis for their child. The series focuses on the assessment, treatment, and prevention of maternal and pediatric obesity and emphasizing the Maternal and Child Heath Life Course Framework as a way to explain the interconnectedness between maternal and pediatric obesity. One colloquium will be held each spring and fall from Spring 2014 through Spring 2018. This program recently celebrated 25 years of supporting innovative, community-based efforts to improve child health. To commemorate this milestone, Healthy Tomorrows created a video to tell the story of the program from around the country. Learn about what nine HRSA-funded grantees, addressing topics on vision health, asthma, medical home, and access to care have accomplished in the program’s 25th year. Published on Jan 22, 2014 Michael Lu, MD, MS, MPH, associate administrator for maternal and child health, discusses the transformation of the Title V Maternal and Child Health Block Grant in preparation for new guidance to be issued in 2015. Examine ways in which this conceptual framework can be used to guide research, evaluation, action and innovation to inform the next generation of MCH measurement systems. Click to view the archived webinar. HHS' National Partnership for Action to End Health Disparities will hold the webinar "Tools to Integrate Equity into Community Health Needs Assessments," sponsored by ASTHO, the National Network of Public Health Institutes (NNPHI), and Community Action Partnership. The webinar will highlight two resources for conducting community health needs assessments with a health equity lens: the America's Health Rankings Health Disparity Tool, which helps identify populations experiencing health disparities, and NNPHI's Community Commons, which provides free access to geographic information systems data for topic areas across the domains of the social determinants of health. Examine methodological questions under discussion by the research community. The Brookings Institution is hosting an innovative event called a MEDtalk. As part of the “Merkin Series on Innovations in Care Delivery ,” this event is based on case study findings of care redesign and sustainability through the lens of pediatric asthma. The event features seven brief “TED-style” talks that consider the challenges of delivering pediatric care, while tackling factors that drive suboptimal care, improving patient and family quality of life, and reducing costs. This event will feature a case that draws on the experiences of the Community Asthma Initiative, an enhanced pediatric asthma intervention and their efforts in sustainability. The agenda includes firsthand experiences from patients, payers, policymakers, and clinical leadership from Massachusetts and Arkansas. Sustainable improvement strategies and the financial mechanisms available to encourage innovations in asthma will be explored. The 90-minute MEDTalk will take place on September 24th, at 10:30am ET. If you’re in Washington, DC, you can join us at the Brookings Institution or if you can’t attend in person, you can watch a live-stream. You can find the full agenda and register here. In addition, journal articles and a white paper will be released following the event. If you’re interested in hearing more about this project, sign up for the newsletter here. Click here for the event agenda and registration. The Colloquium is offered by the University of Tennessee's Public Health Nutrition Program on Friday, September 19, 2014 from 12:30 pm-5:00 pm EDST at the Howard Baker Center on the UT campus. If attending on-site, check-in at 12:30 pm EDST. If participating online, log-on by 12:45 pm EDST. The conference begins promptly at 12:50 pm EDST. Although there is NO COST for the colloquium, space at the Howard Baker Center in Knoxville is limited, so please register early. After you register, a confirmation email will be sent to you; so, please add utphn@utk.edu to your address book. If you will be viewing the webcast in a group setting, EACH participant should complete a separate registration form. Approval for continuing education credits will be submitted for Registered Dietitians and Certified Health Education Specialists. The Division of MCH Workforce Development (DMCHWD) invites you to join us for a New Grantee Orientation webinar. The webinar is targeted to new DMCHWD grantees and any new Training program staff; however, all current grantees, faculty and staff are welcome to participate. Please join the Maternal and Child Health Bureau (MCHB), Health Resources and Services Administration on Wednesday, June 25, 2014 from 1:00-2:00 PM Eastern, for a webcast to learn about MCHB grantees’ experiences in implementation of the Affordable Care Act. Speakers will present maternal and child health population enrollment data from the first open enrollment period and highlight the Statewide Parent Advocacy Network (SPAN) New Jersey and SHIELDS for Families’ efforts to educate and support families to access and understand the value of health insurance. Successes and challenges will also be described. Join us online OR in person at BU School of Public Health (see flyer) If you work with or plan programs for TEENS, you will not want to miss this webinar! Boston University and Harvard University Schools of Public Health jointly present this webinar open to all who work with adolescents. Dr. Bryn Austin of the Harvard School of Public Health, is renowned for her research on aspects of adolescent health, including eating disorders and gender expression, often misunderstood or neglected in public health and medicine. In this webinar she will present research findings on gender expression among teens and the pitfalls of gender stereotyping for their health and wellness. 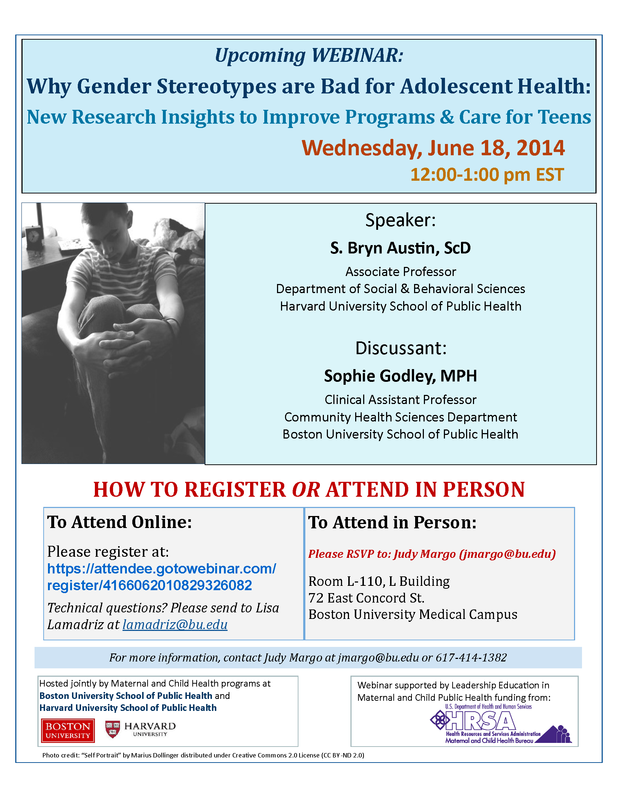 Professor Sophie Godley of Boston University School of Public Health, a longtime expert and practitioner of adolescent sexuality and health, will discuss how the research can and must inform our design of programs and policies for adolescents. The Century Foundation, the Roosevelt Institute and the Academic Pediatric Association would like to invite you to join us for a day-long meeting in Washington on 10 June, where we will explore the impact of poverty on children and families, and discuss possible solutions with colleagues from a wide variety of disciplines and policy backgrounds. No charge for admission, but you need to register to assure a slot. There will be a live webcast of the event. Please RSVP to attend the conference or webcast. Recognizing the importance of early identification and screening, the Administration for Children and Families, Administration for Community Living, Centers for Disease Control and Prevention, Centers for Medicaid and Medicare, Health Resources and Services Administration, Eunice Kennedy Shriver National Institute of Child Health and Human Development, and Substance Abuse and Mental Health Services Administration at the Department of Health and Human Services as well as the Office of Special Education Programs at the Department of Education partnered to launch Birth to 5: Watch Me Thrive!, a coordinated interagency effort to encourage developmental and behavioral screening and support for children, families, and the providers who care for them. Birth to 5: Watch Me Thrive! was launched to the public on March 27, 2014 with release of a compendium of research-based screening tools, “User’s Guides” for multiple audiences, an electronic package of resources for follow-up and support, and a Screening Passport for Families for keeping track of screenings, results, and follow up steps, as well as coordinate information with multiple providers to support interventions and services. During this webinar, representatives from the EC/EI SIG will provide a general overview of current early childhood developmental and behavioral screening efforts. Then federal agency representatives will provide a brief overview on Birth to 5: Watch Me Thrive! The remainder of the time will be an interactive discussion with the federal representatives on how to further integrate comprehensive screening into community systems and the role of medical home in screening efforts. Autism’s Powerful Affinities: Prison or Pathway? The National Institute of Mental Health and Office of Autism Research Coordination are pleased to invite you to attend a special lecture to recognize National Autism Awareness Month. In his talk, Pulitzer prize-winning journalist and New York Times bestselling author Ron Suskind will discuss his family’s 20 years of experimentation with his autistic son’s powerful affinity for animated movies, mostly from Disney, as a tool to open new pathways of communication and social connection. Based on his experience, he poses provocative questions about how the features of autism might be turned from challenges into strengths to help those on the spectrum achieve their full potential. For CDC staff unable to attend the event: The session will be available on IPTV and Envision. To join by Envision, reserve a conference room and make the Envision request or use your local room scheduling process to schedule Envision. For non-CDC staff or those outside the CDC firewall: A live external webcast will be available. Presentations are archived and posted 48 hours after each session. Due to security measures at CDC’s Roybal campus, non-CDC staff who wish to attend these sessions in person must have prior clearance and a U.S. state-issued photo ID (e.g., driver’s license, U.S. passport). Names of non-CDC staff (both domestic and international) should be submitted to the Grand Rounds Team. Please note that all information for international visitors must be submitted at least 10 days in advance. The need for collaboration between primary care and public health is widely recognized, but these sectors don’t have a lot of experience working together. To address this, the de Beaumont Foundation, Duke Community and Family Medicine, and the Centers for Disease Control and Prevention have developed a new tool – A Practical Playbook: Public Health & Primary Care Together. The Practical Playbook is a free, web-based tool designed to facilitate public health and primary care integration by offering a variety of resources for primary care providers and public health officials. For more information, including the archived webinar, click here. Dr. Michael Kramer, an Assistant Professor of Epidemiology at the Rollins School of Public Health at Emory University, where he teaches maternal and child health epidemiology and methods in social epidemiology. His research interests are largely centered at the intersection of perinatal and early childhood outcomes, social determinants of health, and spatial analysis, including work on residential economic and racial segregation and preterm birth, and neighborhood deprivation and early academic readiness. Wednesday, May 7, 2014; 12:00-1:30 p.m. (Central Time). To see the conference flyer for this program click here. To register for this program click here. To view all upcoming programs, visit our website. The webinar will illustrate how the Wisconsin Department of Health Services adopted and executed life course theory to expand preconception care throughout the state, connect MCH and early childhood modes of care while addressing the social determinants of health. Speakers will also reveal how they combined the assets of their MCH and chronic disease divisions to improve overall women’s health. The presenters will communicate why other local and state health departments should adopt this strategic intent in order to reduce racial disparities in birth outcomes by becoming a MCH Life Course Organization. Join the National Center for Medical Home Implementation for the last installment of a free 3-part webinar series focusing on the promotion of partnership and teamwork in pediatric medical homes. This webinar will provide a detailed “How-To” description of starting and supporting family advisory groups, examples of best practices, and insights from parent partners. Register here. This webinar is an opportunity for all Division of MCH Workforce Development (DMCHWD) programs to learn more about the new MCH Workforce Development Center and engage in dialogue around how MCH Training Programs can collaborate with the Center. The purpose of the MCH Workforce Development Center is to provide training, collaborative learning, coaching, and consultation to Title V leaders and staff in four core areas around implementation of health reform: access to care, quality improvement, systems integration and population health management (change management). Dr. Dorothy Cilenti, Director of the MCH Workforce Development Center, will provide an overview of the Center’s purpose and activities to date. DMCHWD staff will moderate a dialogue on opportunities for collaboration following the presentation. Communities across the nation are implementing projects that improve people’s ability be more physically active in their neighborhoods. This webinar will share lessons learned from different communities that increased opportunities for both children and adults to walk, bike, exercise and play through policy and environmental changes. The webinar will also provide evidence on how having access to parks, open space, trails, and other venues for physical activity is related to better health. Representatives from two different communities will share their stories, including successes in underserved neighborhoods to improve safety, aesthetics, and access to places to be active. The multimedia archive of the MCH 3.0 Virtual Town Hall for the Division of MCH Workforce Development Programs that took place on Thursday, January 9, 2014 is now available! Please join the Maternal and Child Health Bureau, Health Resources and Services Administration for a webcast focusing on the historic coverage expansions in January 2014 under the Affordable Care Act. The session will include a brief overview of the two major pathways to health care coverage for maternal and child populations. Then the webinar will look at strategies and resources so you can help educate others about the new insurance options open to them for enrollment. Information on the different types of consumer assistance available will be shared and there will be time for questions and answers as well. An orientation for new grantees of the Division of MCH Workforce Development was held September 19th, 2013. If you missed it, or would like to view it again, the webinar archive is now availabe.